Using autonomous drone technology, Scorpiox services the last minute-last meter delivery of goods (2kg and under) in urban environments. With their modular delivery mechanism and proprietary software, drones can be integrated into their platform. Developed proprietary last minute, last meter delivery process and technology. Droneable develop highly modularised drones for a variety of industrial purposes. Droneable’s team has the perfect balance between mechanical, structural and electronic design, and they have developed heavy-duty drones for the agro-industry. Ahead in 2018, Droneable's main goal is to fully automate precision agriculture. EyeROV is an underwater drone. 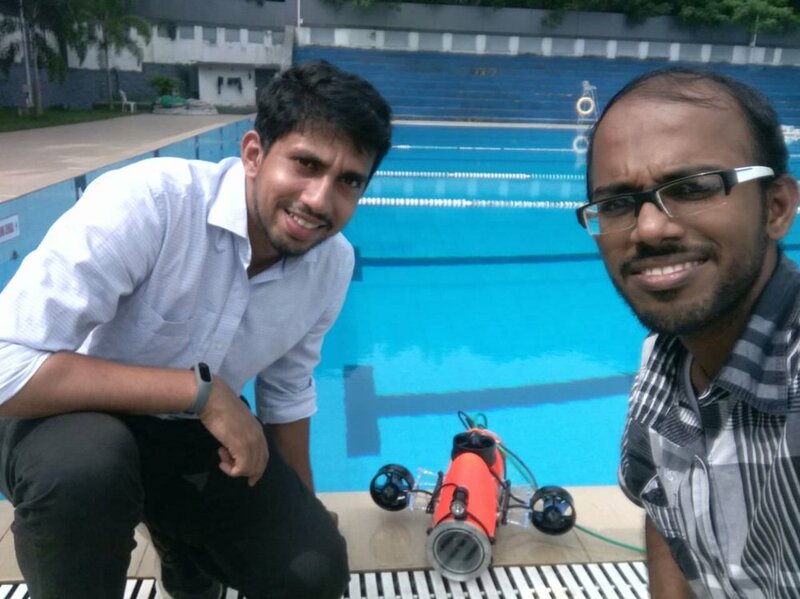 An underwater drone that is a highly controllable, easy to use, lightweight for underwater inspections and monitoring. Autonomously protect your vehicle while parked. Receive video evidence when someone hits your car. HueCore is developing the first and only IoT product designed to protect vehicles while parked. VARU will assist insurance companies to reduce their exposure by providing real-time accident reports. Lantrn has reinvented baggage security to better detect, disrupt and ultimately deter crime. Lantrn has created a digital suitcase lock that monitors luggage and deters tampering by providing the data needed to easily catch those responsible - think of it as a home security system for suitcases. Partnership with leading industry players (YiFeng and Travel Sentry) that provide immediate access to over 50% of the luggage market. Raspect is a drone-based inspection platform. A multi-sensory real-time analytic inspection software solution on drone. The drone is a vehicle for the automation of inspection like rails, exterior of aircrafts, exterior of buildings. Poladrone is building the future of aerial data collection & analysis from Malaysia. Using advanced algorithms and a fleet of drones, Poladrone collects and processes data to allow businesses to make data driven decisions remotely. Improving shrimp farming with connectivity. A multi-sensor device that is easy to use and affordable for the majority of Indonesian shrimp farmers that are independent small holders. Paired with the software platform, farmers can monitor and adjust their treatments and techniques to ensure a healthy and bountiful pond. Katana is a modular Internet of Things platform that helps poultry farmers better predict the future and optimize their revenue. Using sensors, farmers can collect data and compare it to optimal poultry cycles. WeSee.Live is the first VR video education platform. Virtual reality tutorials anywhere, anytime. Kapetair is developing vertical takeoff and landing, fixed-wing drones. The aircraft has as much as 6 times longer flight duration and range than traditional professional drones. Sky-Drones develops flight control systems and autopilot for surveying, mapping, inspection, security, safety and high-quality media production. Smart AP undertakes R&D and manufacturing of the flight control systems for unmanned aerial vehicles. They develop custom software: flight controller firmware, ground control station and simulation toolkit. Silentmode is the ultimate powernap mask. An ecosystem of products to ‘power-break’ and the data to understand the improvement they make on our mind and body. Technology is able to reduce heart rate by over 25% within five minutes. A technology platform for preventative diabetic health care. Their first product, a smart insole with a proprietary embedded graphene sensing system, passively monitors the skin’s physiological signals in order to detect early signs of foot ulcers. This simplifies patient self-monitoring and reduces the frequency of doctor visits. A smart baby journal for working parents. A smart baby journal for working parents, including a wearable for caregivers to easily track baby’s daily feeding and behaviour, a connected charging station that doubles as an air quality monitor and a standalone app focused on premium UX and real-time notifications. Fitguard is a mouthguard to help detect head-injuries. An intelligent mouthguard and smart platform to address the mass market’s need to identify, document and monitor head impacts. Hipo by Mosaikx provides better care for patients of Alzheimer's by allowing their family members to monitor their daily essentials. An intelligent platform for senior care. Altizen is a smart standing workstation. Andrew and Yuying are creators of smart furniture that boosts user health & productivity, starting with the Altizen. The Altizen is a fully customisable, smart sit-stand workstation that works with your existing desk. Stay connected to your child's wellbeing. A wearable tracking key health and wellness metrics for kids aged 3-10 years. Enabling early warning, Kiddo can detect and prevent fever, dehydration, and heat stroke before health conditions become life threatening.